It’s Super Bowl week and football fans are gearing up to get their last fill of their beloved sport before going into hibernation until draft day or training camp. Looking back over the past year, it’s been interesting to see how the NFL has pushed the limits of its branding. And unfortunately, probably pushed it too far. While the NFL has been using throwback uniforms for several years, this year’s experimentation with uniform colors didn’t add to the nostalgia. In fact, I’m not sure what it added, besides confusion. Ultimately, it eroded the visuals of one of the strongest sports brands in the world. I am all for freshening up a brand from time to time, but this year the NFL went over the top. From a branding perspective, two pillars support all good branding: differentiation and consistency. Differentiation isn’t really an issue for the NFL as it has no direct competition, and is certainly a monopoly in business terms. But the consistency pillar is where I think the NFL failed. So what’s the big deal with changing a few colors? Color has power in both recognition and emotional connection. I love my Packers’ green and gold; but not the beige and navy they wear as part of their throwback uniforms. This emotional connection I, and many fans have, has been fostered by years of consistent application. The dramatic changes witnessed this year, with no apparent reason for doing so, is undermining my connection with the NFL brands. When the NFL introduced throwbacks, they had a reason. It was the NFL’s 75th anniversary and to celebrate teams were allowed to wear modern versions of their old uniform styles. That’s a good reason. It also makes sense to change colors, and even logos, when a team’s ownership is trying to create a new image – such as after many years of losing and a winning atmosphere and excitement with their fan base is trying to be created. But this season seemed to be change for change sake. And it wasn’t just modifying colors. New colors were added that had no history to the team or the league. 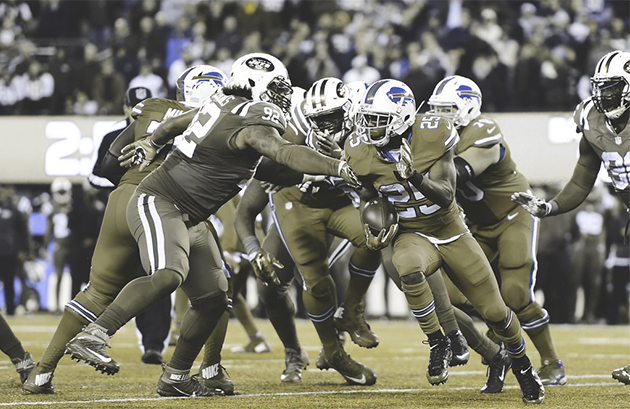 Thursday night NFL games in particular turned into a showcase of color-on-color experimentation. The most disastrous visually was a November game between the Buffalo Bills and the New York Jets. Someone must’ve forgotten that nearly 10% of the viewing audience suffers from color blindness, making it impossible for them to differentiate the two teams based on color. This decision to change the brand colors actually interfered with many loyal fans’ ability to enjoy the product. This photo was altered to show how someone with color blindness would view the game. I also know of fans who missed games because of the new uniform colors. They scanned the TV channels looking for a specific game to watch, only to not recognize the teams playing because the uniform colors were not what they were looking for. The need for consistency is something we talk a lot about with our clients when surveying their communication materials. Don’t forsake differentiation and consistency for gimmicky, off-strategy communications. You need to look at color as a strong recognition tool. You need to keep your message consistent. When you tire of your look is about the time the market is beginning to recognize that you’re presenting yourself in a certain way. Be patient, stay consistent and use a compelling brand story to drive change – not your own boredom.